One of my favorite classic labels to kind of dig into the catalog and wander around with my ears is the mighty Dunhill. In many ways the house label for West Coast folk rock, Dunhill released some of the best popular (Mamas and Papas, Grass Roots) and obscure (Lamp of Childhood) sounds of the 1960s. Today’s selection dwells in that obscure end of the catalog. 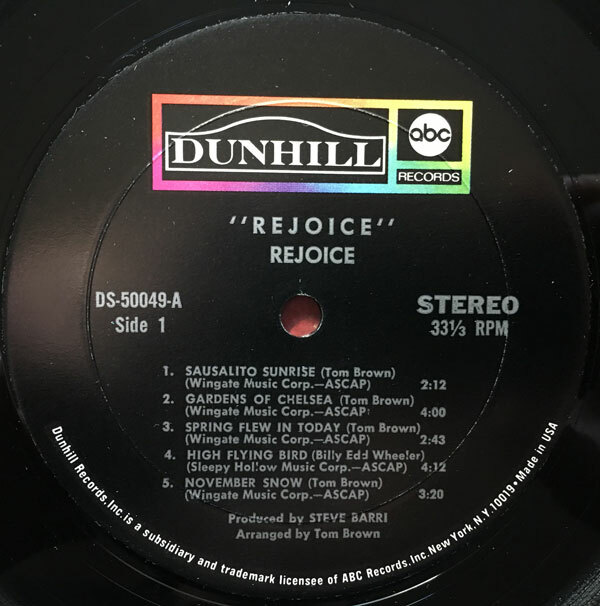 Rejoice, actually husband and wife Tom Brown and Nancy Brown , recorded one album for Dunhill in 1968 (which yielded three 45s, all LP tracks) and then (seemingly) nothing else, ever. The self-titled album is pretty cool, though in 1968 it seems a little bit behind the wave, musically, probably fitting better stylistically a year or two earlier. The overall style of melodic folk rock, and the Browns alternating on lead and harmony vocals. The track I bring you today is my favorite from the album, ‘Gardens of Chelsea’. ‘Gardens of Chelsea’ is one of those records that isn’t specifically psychedelic, yet exists in a neighborhood surrounded by it, more like a supremely mellow, marijuana haze than anything hallucinogenic. The arrangement switches between a small band, and a subtle string arrangement, with the Browns singing in unison. This is – at least in my approximation – a perfect bit of mid-to-late 60s California music. There’s no video for this song, but I can still see one, with the pair walking in Laurel Canyon, with soft focus and lens flares as the sun comes into focus. 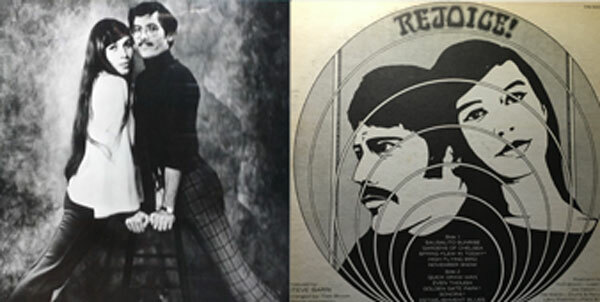 Though the album credits a who’s who of the Wrecking Crew, what little info is out there suggests that Rejoice was originally a self contained band that started to record, then after an interruption in the process, the Browns went back into the studio with the pros and completed the album. Despite a brush with the far reaches of the charts, Rejoice appears to have broken up the following year and vanished.